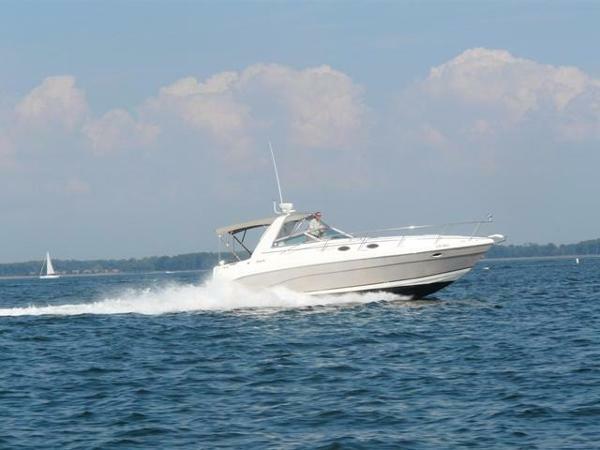 2006 Rinker 410 Express Cruiser Owner has enjoyed this beautiful express cruiser with his family and has now moved on to his next boat. Many upgrades: -Diesel Power! 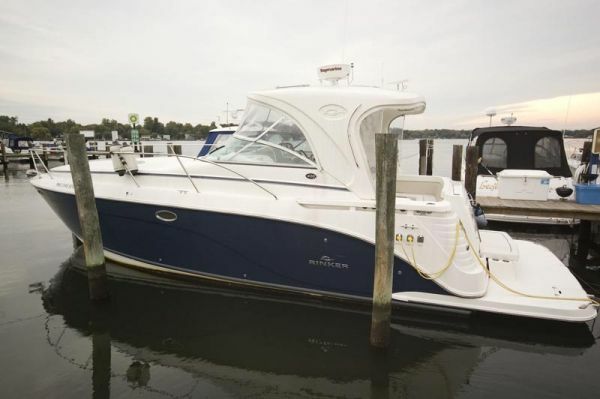 -all new Garmin electronics within the last two seasons - SAT tv -hard top - Cummins diesels -diesel genset 10KW This boat has spent its entire life here in the brackish waters of the Chesapeake bay. 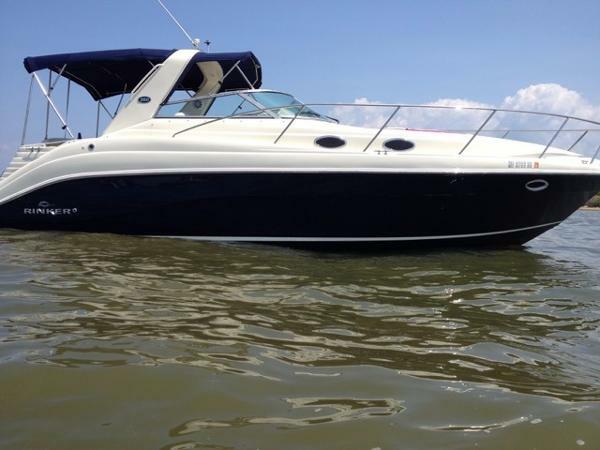 2003 Rinker 342 Express Cruiser New Listing With Specs And Pics To FollowThis 342 Rinker HAS A PAINTED HULL SO NO FADE IN YOUR FUTURE!! 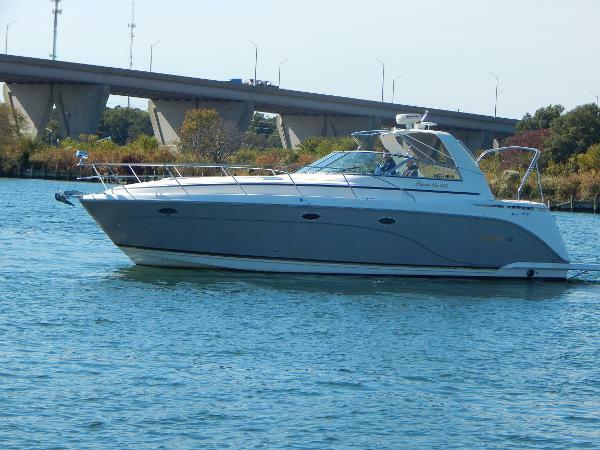 2005 Rinker 410 Fiesta Vee SHE IS A BEAUTIFUL "RINKER" THIS BOAT IS THE VERY ROOMY AND GORGEOUS "410 FIESTA VEE" PROUDLY BUILT BY RINKER. 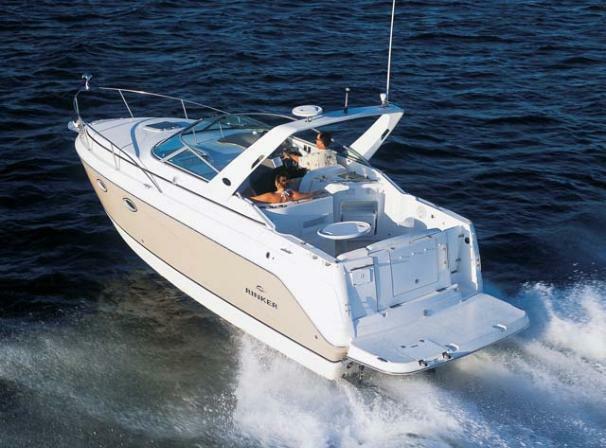 SHE IS POWERED BY TWIN 8.1L MERCRUISER FRESH WATER COOLED INBOARDS WITH ONLY 200 HOURS AND HAS 420 H.P. EACH. THIS BOAT IS NICELY EQUIPPED WITH AIR CONDITIONING, REVERSE CYCLE HEAT, GENERATOR, ELECTRONICS, COMPLETELY EQUIPPED GALLEY, SEARCH LIGHT, WINDLASS, ICE MAKER, SPREADER LIGHTS, AFT DECK REFRIGERATOR, BOW THRUSTER, WASHER/DRYER, COCKPIT SHOWER, HELM AND AFT DECK CARPETING, SWIM PLATFORM, AM FM CD PLAYER WITH CD CHANGER, VCR UNIT, DVD PLAYER, CENTRAL VAC, TRASH COMPACTOR, UNDERWATER LIGHTS, THREE TELEVISIONS, SPARE PROPS, COLORED HULL AND SO MUCH MORE. 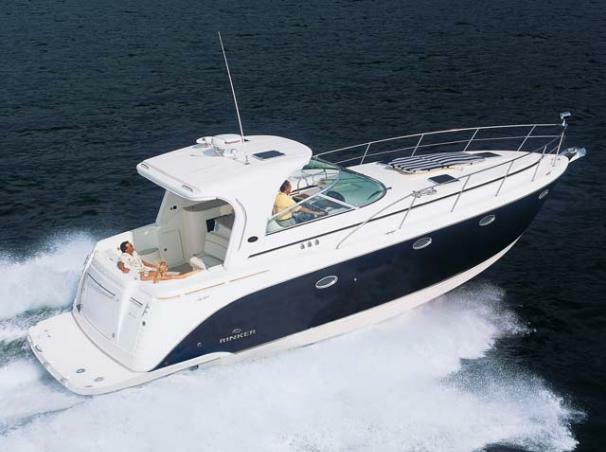 Rinker’s largest boat ever, the 410 Fiesta Vee is a roomy midcabin cruiser whose affordable price included an impressive array of standard features. Built on a modified-V hull with a solid fiberglass bottom, the highlight of this big express is her spacious interior with its 7-foot headroom, full-size sofa, and copious storage. Privacy doors separate the fore and aft staterooms from the main salon, and both staterooms come with built-in TVs. In the alcove just off the head is a full-size washer/dryer combination, while the galley features not just the expected microwave, but a real oven. Topside, the cockpit comes with a double helm seat, wet bar with refrigerator, icemaker and blender, and a U-shaped aft lounge that converts into a big sun pad. Additional features include cherry interior joinery, transom storage locker, and a gas grill that slides into a base of the extended swim platform. CLICK ONTO FULL SPECS FOR PICTURES AND INFORMATION. 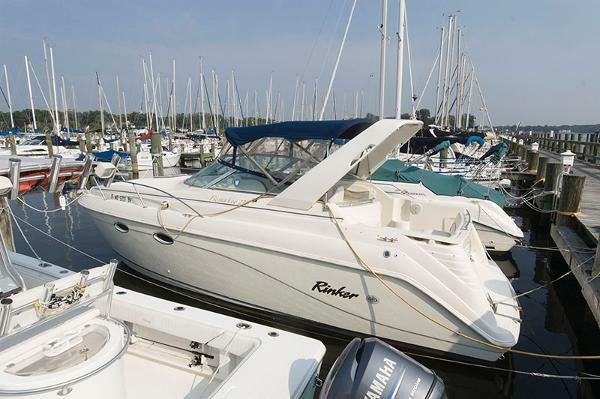 2005 Rinker 410 Express Cruiser SHE IS A BEAUTIFUL "RINKER" THIS BOAT IS THE VERY ROOMY AND GORGEOUS "410 EXPRESS CRUISER" PROUDLY BUILT BY RINKER. SHE IS POWERED BY TWIN 8.1L MERCRUISER FRESH WATER COOLED INBOARDS WITH ONLY 200 HOURS AND HAS 420 H.P. EACH. 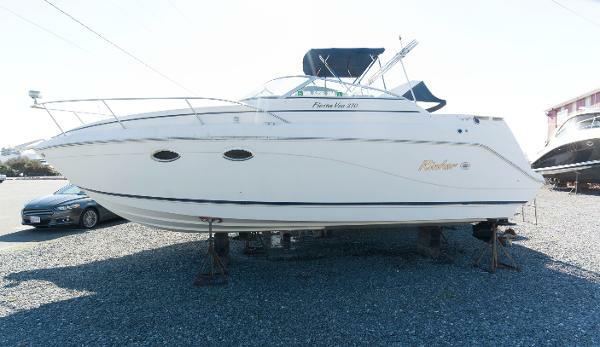 THIS BOAT IS NICELY EQUIPPED WITH AIR CONDITIONING, REVERSE CYCLE HEAT, GENERATOR, ELECTRONICS, COMPLETELY EQUIPPED GALLEY, SEARCH LIGHT, WINDLASS, ICE MAKER, SPREADER LIGHTS, AFT DECK REFRIGERATOR, BOW THRUSTER, WASHER/DRYER, COCKPIT SHOWER, HELM AND AFT DECK CARPETING, SWIM PLATFORM, AM FM CD PLAYER WITH CD CHANGER, VCR UNIT, DVD PLAYER, CENTRAL VAC, THREE TELEVISIONS, SPARE PROPS, COLORED HULL AND SO MUCH MORE. 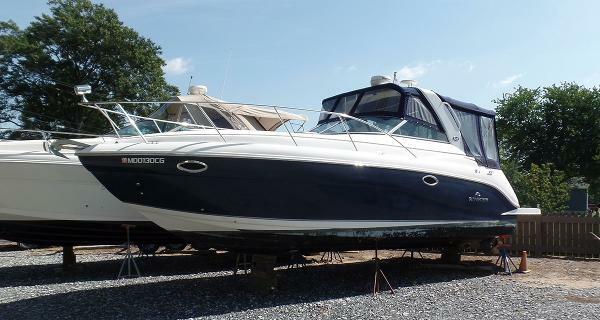 Rinker’s largest boat ever, the 410 Express is a roomy midcabin cruiser whose affordable price included an impressive array of standard features. Built on a modified-V hull with a solid fiberglass bottom, the highlight of this big express is her spacious interior with its 7-foot headroom, full-size sofa, and copious storage. Privacy doors separate the fore and aft staterooms from the main salon, and both staterooms come with built-in TVs. In the alcove just off the head is a full-size washer/dryer combination, while the galley features not just the expected microwave, but a real oven. Topside, the cockpit comes with a double helm seat, wet bar with refrigerator, icemaker and blender, and a U-shaped aft lounge that converts into a big sun pad. Additional features include cherry interior joinery, transom storage locker, and a gas grill that slides into a base of the extended swim platform. CLICK ONTO FULL SPECS FOR PICTURES AND INFORMATION.